If you want an employee to participate meaningfully in your organization, it would be a mistake to ignore the importance of culture fit. A mismatch between your company’s culture and an employee’s personality can result in miscommunication, poor productivity, and disengagement. From an organizational standpoint, this oversight can lead to high turnover, which is costly and inconvenient. With stakes that high, it’s no wonder many employers look for ways to ensure that a candidate will complement and enhance the existing workplace culture before making a job offer. One method that’s gained traction in many companies is the use of personality tests (such as Myers-Briggs, DISC, The Five-Factor Model, etc.) in the recruiting process. But is this a good use case? What can these tests tell you about how well an employee will fit in at your workplace? Are there other useful applications for personality surveys in corporate life? Let’s take a look at some of the most common types of tests and their best use cases. Extroversion vs. Introversion (E or I); this describes how the person interacts with others. Sensing vs. Intuition (S or N); this describes how the person accesses information. Thinking vs. Feeling (T or F); this describes how the person makes decisions. Judging or Perceiving (J or P); this describes the person’s way of looking at the world around them. The combination of each person’s tendencies on each measurement produces one of 16 possible four-letter types. For instance, someone who is extroverted, intuitive, feeling, and perceiving would be typed with the shorthand “ENFP”. There are many places to take a simple MBTI test online for anyone who doesn’t readily know their type. Websites like 16Personalities can help employers get an overview of each employee or candidate’s personality, as well as some general guidance on their tendencies in the workplace. There are many places online to take a DiSC assessment, but one particularly useful option for teams is Crystal, which allows coworkers to see their results in relation to one another’s, and offers practical guidelines on how to work and communicate with each other. Test-takers are given a score of 0-100 for each of these traits, with higher scores indicating a higher degree of identification with each of the traits. The score that is furthest from 50 (whether higher or lower) represents the person’s most dominant trait. That means that someone with a score of 20 on extroversion and all other scores in the 50-60 range would be most marked by their introversion (the opposite of a high score on that trait). As with the other tests, this one is available for free on several websites, with expanded data available at a small cost. Check out a free 300-question version of this test here. HR managers and team leaders may want to consider administering a personality survey to a team, department, or entire company. The results can help company leaders understand some key patterns, such as which traits are most common among top performers or what mix of traits is present on the most effective teams. 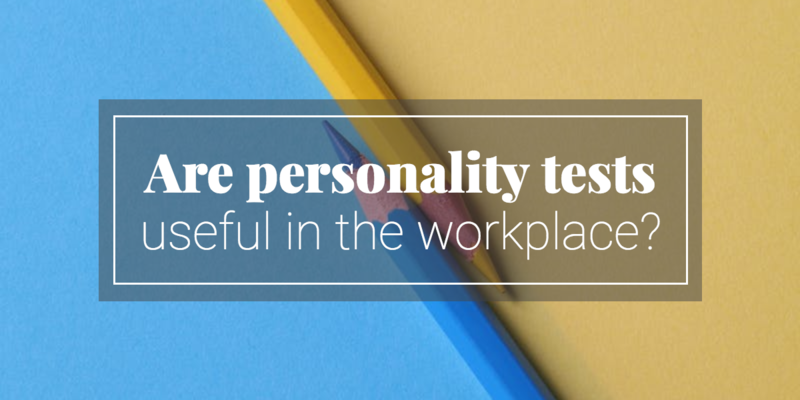 Personality test results can also help employees who work closely with one another learn how to communicate and manage conflict more effectively. While it may seem like a personality test is a great shortcut to understanding applicants and making the best choice for the company, recruiters and hiring managers should use this approach with caution. With a job on the line, applicants may feel incentivized to try to “game” the test and answer questions based on what they think the employer is looking for, rather than what’s most accurate about their own personalities. But that doesn’t mean personality typing can’t be useful in helping your company find the right person for a job. The key is to use personality testing on existing employees and use the findings to help guide the hiring process. With a good understanding of personality and relationship dynamics in the company, it’s easier to craft a job description that will appeal to the type of person your company is looking to hire, or fine-tune interview questions to find the candidate with the personality traits that are most important to you. When your company needs to fill a management or leadership role, it may be tempting to reward your strongest employees with a promotion. But for some high-performing employees, a promotion into a management role would represent a fundamental personality mismatch. With personality survey data on your current employees, it’s easier to identify which personalities thrive in managerial roles, and which ones thrive as individual contributors. This data can also help company leaders decide when it’s time to offer an employee a lateral move that would put them in a role more compatible with their preferences. Personality typing can be a powerful tool for HR managers and company leaders. When wielded correctly, personality tests should help companies make more data-driven decisions about hiring and promoting employees and teach employees the best ways to work together. However, it’s important to remember that this data represents just some of what makes your employees tick. Test results may be a useful access point to get a better understanding of the people you work with, but they’re no replacement for getting to know each person as an individual. Want to stay on top of HR news and best practices? Subscribe to the Fuse Workforce blog to get updates sent directly to your inbox every week.